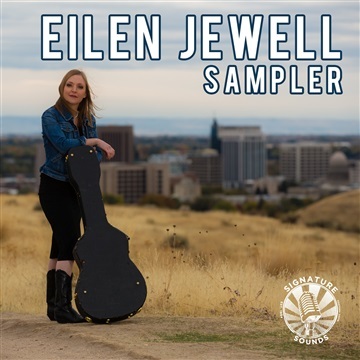 To celebrate the release of Eilen Jewell's 6th studio album, Sundown Over Ghost Town, Signature Sounds is offering this sampler which includes "Rio Grande" from the new album, along with favorites tracks from Eilen's past albums. Sundown Over Ghost Town kicks off with “Worried Mind,” a bittersweet song of searching and redemption. Propelled by guest artist Jake Hoffman’s wistful pedal steel and the opening lyrics, Been all around this world, just to come back to you. Oh my love, my sweet love. It’s a long and lonesome highway, it’s a bitter shade of blue. Oh my love, my sweet love, Jewell begins her magic act of transporting listeners to some mystical far-away places. “Hallelujah Band” is next and tells a couple of true stories. “The first is about an experience I had as a teenager with my best friend,” relates the artist. “Her boyfriend somehow knew of an unmarked, underground cave in the middle of the desert. We climbed down there with flashlights in our teeth and hiked around for hours. There was water down below and freight trains up above. It was a religious experience for me that has stuck with me to do this day. Something poignant like that happens and you realize what a big life it is, what a glorious world. I may not be worthy but I’m going to join in anyway. And the second story in that song is about how, when I was a little girl I had a secret land that I would go visit. It was just a little indentation in the ground, and I’d sit on the pine needles with my doll. But it carried a lot of importance for me and still does. I would never be able to find that spot now. It’s crucial that I remember to look for it though, at least symbolically. The goal is to stay available, to be ready to be that instrument for God, or Goddess, or whatever you want to call it, should you be chosen to join the band.” Like so many of Jewell’s songs, she packs much heart and soul into a catchy, three-minute song. Moving back to Boise certainly invigorated Jewell’s songwriting and informs much of Sundown Over Ghost Town’s spirit and majesty. But there’s another huge, yet tiny, force playing a pivotal role in making the album so astonishingly good. Her name is Mavis (yes, as in Mavis Staples), and she was born to Eilen and Jason about halfway through the recording of Sundown. The album’s closer, “Songbird,” is one of the most hauntingly beautiful songs ever written about the miraculous joy and impact of a new family member. And as always, Jewell holds nothing back in her writing and storytelling. Listen closely and you’ll hear little Mavis’s voice, cooing sweetly in the background. In concert, don’t be surprised to see Jewell perform this alone, with just her guitar and harmonica, as an encore. And don’t be surprised if there aren’t many dry eyes in the house. Reflecting on the making of Sundown Over Ghost Town and the album’s spirited sound, Jewell concludes, “When I moved back to Boise in 2012, I was confronted by a lot of memories, mostly from childhood. Certain places conjured some ghosts for me: a pasture near my house, a stretch of desert outside of town, the street where I grew up, the family land in the mountains not far from here... Each small place within the bigger setting of southern Idaho contains its own hugely important memory for me. I feel like the album is an attempt to describe this place, as well as what it has meant to me all my life, the place it holds in my heart. A lot of my favorite spots from childhood are largely unchanged, but then I’ve changed so much that my relationship to them is completely different nowadays. And then, of course, the city is much bigger than the one I left behind, and that has presented pros and cons. I hate seeing that pastureland disappear into subdivisions, yet I enjoy how alive the downtown area has become. And those memories, those keen observations, and plenty of musical magic are shining on Sundown Over Ghost Town.